If you’re an IT professional or someone wanting to break into the glamorous world of IT, then you’ve probably considered certification. Perhaps your employer wants you to certify or maybe you think it’s time for a career move and you want to explore IT certifications. It’s confusing because there are so many certifications out there and not all of them are valued by employers or other IT staffers. This guide will help you identify the relevant certifications and why they’re relevant. Almost every major vendor has some sort of certification plan for its products. I want to caution you against those. 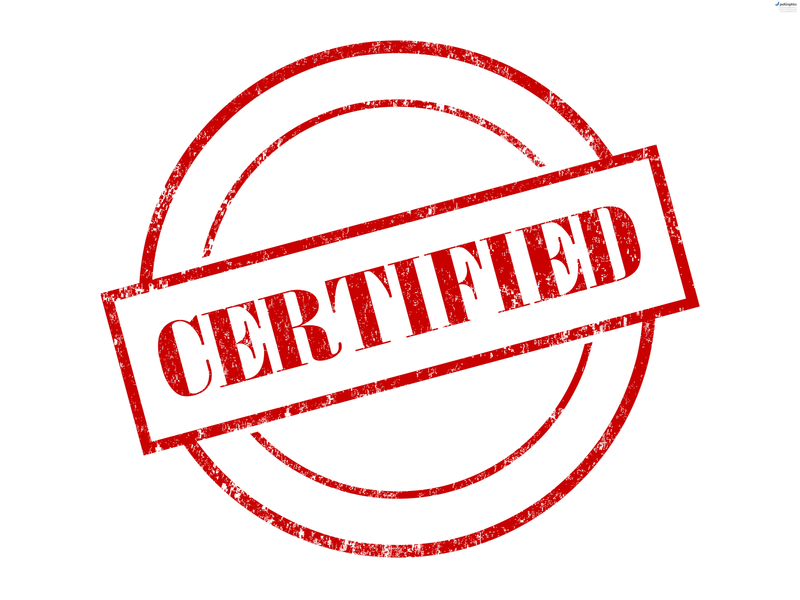 If a certification has a vendor label on it, I suggest that you pass it by unless you work with that product exclusively. There are, of course, exceptions. Cisco is one of those exceptions. Cisco certifications, such as the CCNA, CCIE, and CCNP are valuable, valued, and the most sought after in the business. The reason? They’re hard to pass. But that is only one reason. Other reasons include: There are jobs in the network administration field, you have to have significant experience to pass them, the jobs available for individuals who hold those certifications pay well. But exercise a bit of caution here. They’re expensive to take. The training is expensive too. The fail rate is very high, so unless you’re 100 percent dedicated to it, don’t waste your money and your time. CompTIA certifications are highly valued in the IT business too. After Cisco, these are the ones that everyone wants. The reason? They’re vendor neutral. Certifications such as Security+, Server+, Network+, Linux+, and A+ test your knowledge of the topic while remaining vendor agnostic and that’s only a sampling of CompTIA’s certifications. Training sources are up to you and not required. You can register, pay, and take a CompTIA exam any time you wish. Your life experience can be your training. Other reasons why CompTIA exams are so valuable is that they test every aspect of a topic in considerable depth. If someone has, for example, passed the A+ exam, there’s a body of knowledge you know that individual has at his or her disposal and there’s no question about it. ITIL Foundations certification is an extremely valuable certification, especially with larger companies, because of policies and regulations centering around change control. ITIL Foundations classes are relatively expensive and the test is rigorous, although many trainers boast a very high pass rate. My suggestion is that you focus during the three-day long class and study until you’re bored for the exam. Microsoft certifications are a whole different animal unto themselves. Some of the certifications are very difficult to pass, while others require no experience and very little study in order to achieve success. During the late 1990s, certain Microsoft certifications were shunned by the IT community because there were so many newbies entering the field who we dubbed, “Paper MCSEs.” It was true. A person with no experience could attend a class and pass the MCSE exam. It was this exam that turned many IT professionals against certification programs and against those who were certified. Microsoft has revamped its certification program considerably since those days and the number of Paper MCSEs has dropped significantly in response to those changes. These days an MCSE is a good place to start, but only if you couple it with another vendor neutral certification or two, such as the CompTIA ones. The Microsoft Developer certification program is excellent as is its database certification track. If you have aspirations beyond tech support, check those out. VMware certifications are another exception to the vendor certification smackdown that I gave earlier. VMware certifications for its core products are highly valued. The VCP is an honored and honorable certification. The training is expensive and the test is rigorous. Take the plunge if you have some experience and the training behind you. Couple it with another vendor neutral certification for better value. Project Management certifications are absolutely essential in gaining any kind of momentum behind your career as a project manager. The PMP is the gold standard in the industry for project management professionals. There are too many related certifications to mention here, but these are widely recognized and considered required for positions in the industry. Fortunately in some jobs, you can negotiate IT training that leads to certification, plus the testing fee which can be quite high in some cases. Be prepared to sign a contract for payback if you leave the job in less than a year of service after such training. A word of caution about certification. When you certify on a product, be aware that when the new version of that product hits the market, you’ll have to certify on the new product as well. In some circles, we call this the “certification money racket.” This means that even if you are certified on Product X version 6.0, when Product X version 7.0 is released, you’ll have to take a new class and pay a new testing fee to certify. And most certifications, vendor-oriented or vendor neutral have an expiration date. Most professionals who I know who are “certification junkies” (The ones who have several certifications behind their names) consider new certifications as continuing education and part of the cost of being an IT professional. If you’re interested in becoming a certification instructor, the exams are the same, but you’ll have to achieve near perfect scores on the exams to attain instructor status. No certification is worth the price if you don’t have experience, although many newcomers believe (falsely) that certification without experience helps them break into the business. My best advice is to get some real world experience (at least one year) and couple that with your certifications. If you’re serious about the IT business, especially in large companies, this approach will give you the highest return on your investment. If you can’t acquire an entry level job in which to gain some skills, buy or lease some computer equipment and learn on your own. If you are lucky enough to get an interview, there will be a team of skeptical IT professionals who will test your knowledge and they might not be nice about it, so lose the attitude and show that you know something practical as well as having the certification. Best of luck to you in your pursuits. Feel free to contact me for further information and pointers. Disclaimer: This was a non-sponsored post. Sponsorship: If you wish to sponsor a post or to have a product reviewed, contact me. Campbell, Calif. (MARCH 10, 2015) – Barracuda Networks, Inc. (NYSE: CUDA), a leading provider of cloud-connected security and storage solutions, today announced that Barracuda NG Firewall, Barracuda Message Archiver, Barracuda Spam Firewall and Barracuda Web Application Firewall have achieved VMware Ready – vCloud Air™ status. This designation indicates that the products have undergone technical validation within the vCloud Air environment, and are supported on VMware vCloud Air®. “We are pleased that Barracuda has joined the vCloud Air ISV Program and has achieved VMware Ready – vCloud Air certification. Barracuda NG Firewall, Barracuda Message Archiver, Barracuda Spam Firewall and Barracuda Web Application Firewall qualify for the VMware Ready – vCloud Air logo, signifying to customers that it works seamlessly within VMware vCloud Air, and can be deployed in production with confidence,” said Howard Hall, senior director, Alliances, VMware. Additionally Barracuda is a member of the Access tier of the vCloud Air ISV program and is listed on the VMware Solution Exchange. Barracuda NG Firewall: Delivers next-generation firewalling capabilities and high-speed (>1Gbps) site-to-site remote access to on-premises, hybrid and cloud environments. Barracuda Message Archiver: Delivers cloud-connected email archiving for efficiency and eDiscovery in hybrid cloud environments. Barracuda Spam Firewall: Provides best-of-breed email threat protection, allowingcustomers to encrypt messages and leverage the cloud to extend email protection if mail servers become unavailable. Barracuda Web Application Firewall: Provides a secure path for customers to move their applications dynamically throughout the data center and into the cloud. The VMware Ready program is a co-branding benefit of the Technology Alliance Partner (TAP) program that makes it easy for customers to identify partner products certified to work with VMware cloud infrastructure. Customers can use these products and solutions to lower project risks and realize cost savings over custom-built solutions. With thousands of members worldwide, the VMware TAP program includes best-of-breed technology partners with the shared commitment to bring the best expertise and business solution for each unique customer need. For more information about Barracuda security and storage solutions available on vCloud Air, please visit http://cuda.co/cudavcloud. Barracuda NG Firewall on vCloud Air is available today in the Bring Your Own License (BYOL) model and can be found within the online VMware Solution Exchange (VSX) at http://cuda.co/ngfwvcloud. Barracuda Message Archiver on vCloud Air is available today in the BYOL model and can be found within the online VMware Solution Exchange (VSX) at http://cuda.co/bmavcloud. Barracuda Spam Firewall on vCloud Air is available today in the BYOL model and can be found within the online VMware Solution Exchange (VSX) at http://cuda.co/bsfvcloud. Barracuda, Barracuda Networks, and the Barracuda Networks logo are trademarks or registered trademarks of Barracuda Networks, Inc. in the U.S. or other regions. This press release contains forward-looking statements, including statements regarding the interoperability, benefits, and performance of the Barracuda products with VMware vCloud Air. You should not place undue reliance on these forward-looking statements because they involve known and unknown risks, uncertainties and other factors that are, in some cases, beyond the Company’s control and that could cause the Company’s results to differ materially from those expressed or implied by such forward-looking statements. Factors that could materially affect the Company’s business and financial results include, but are not limited to customer response to the Company’s products, as well as those factors set forth in the Company’s filings with the Securities and Exchange Commission. The Company expressly disclaims any intent or obligation to update the forward-looking information to reflect events that occur or circumstances that exist after the date of this press release. VMware, VMware vCloud Air and VMware Ready are registered trademarks or trademarks of VMware, Inc. in the United States and other jurisdictions. The use of the word “partner” and/or “partnership” does not imply a legal partnership relationship between VMware and any other company. 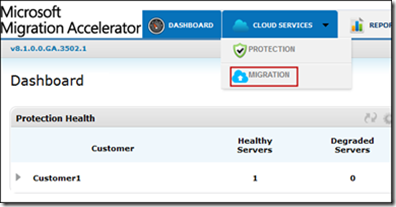 Announcing the limited preview of the Migration Accelerator (MA), for Azure. Spawned from the technology of Microsoft’s InMage acquisition announced July 11th the MA is designed to seamlessly migrate physical, VMware, AWS and Hyper-V workloads into Azure. It automates all aspects of migration including discovery of source workloads, remote agent installation, network adaptation and endpoint configuration. With MA, transitions into Azure can occur in mere minutes! Heterogeneity: With MA you can migrate workloads running on a broad range of platforms such as VMware, Microsoft Hyper-V, Amazon Web Services and/or Physical servers within your environment. MA can support workloads running on Windows Server 2008 R2 sp1, Windows Server 2012 and Windows Server 2012 R2 operating systems. Simple, Automated Migration: The MA portal allows you to automatically discover your enterprise workloads, remotely from the cloud. With few clicks you can configure end-to-end migration scenarios. MA allows you to test your workload in the cloud without impacting the existing on premise production workload, offering the ability to validate workload functionality before a cutover is performed. Migrate Multi-tier Applications: MA boasts the unique ability to migrate multi-tier production system with application level consistency, orchestrated across tiers. This ensures multi-tier applications run the same in Azure, as they ran at the source. Application startup order is even honored, without the need for any manual configuration. 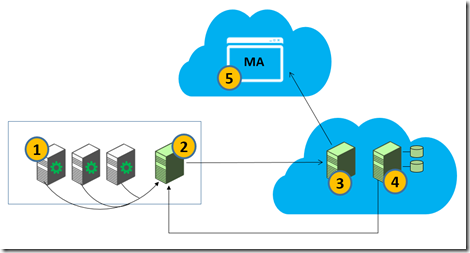 Continuous Replication, Least Cutover Time: MA for Azure provides full-system replication including the OS and application data. This continuous replication and in-memory change tracking reduces the cutover time to mere minutes, minimizing impact to production workloads. Mobility Service: A light weight (guest based) centrally deployed agent which gets installed on source servers (on-premises physical or virtual) to be migrated to the target virtual machines on Azure. It is responsible for real time data capture and synchronization of the selected volumes of source servers to target servers. Process Server (PS): A physical or virtual server that is installed on premise. It facilitates the communication between the Mobility Service and target virtual machines in Azure. It provides caching, queuing, compression, encryption and bandwidth management. Master Target (MT): A target for replicating disks of on premises servers. It is installed within a dedicated Azure VM in your Azure subscription. Disks are attached to the MT to maintain duplicate copies. Configuration Server (CS): Manages the communication between the Master Target and the MA Portal. It is installed on a dedicated Azure VM in your Azure subscription. Regular synchronization occurs between the CS and MA Portal. MA Portal: It is a multitenant portal by which you can discover, configure protection and migrate your on premise workloads into Azure. After installing the Mobility Service, you can configure replication for selected servers by choosing the Protect option. MA uses the configuration details garnered from the discovery process for the protected source servers to determine and provision the most suitable sizing for the environment within Azure. In addition, the target VHDs are provisioned on the Master Target. Once replication is setup, synchronization of the on premise server disk to the target VHD in the Azure cloud begins. Now, that you have configured the initial sync, wait to ensure the initial replication is complete. 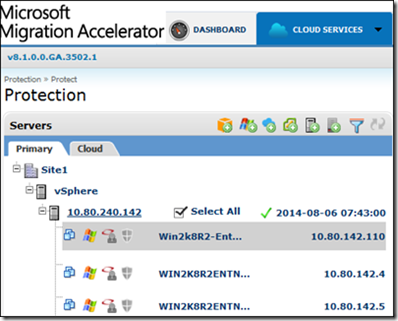 After initial replication, select the Migration option from the Cloud Services menu. From the list of protected servers that appear under Protected Application, select the “protection plan” or list of assets you wish to migrate. 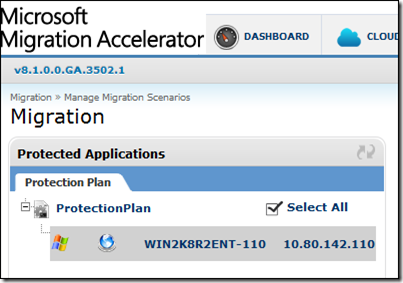 Once you choose a protection plan it will appear under Migration > Selected Hosts. Click Migrate to start the migration process. You can now monitor the progress of migration under Migration Scenarios > Migration Status. After successful migration, Virtual Machines are created in Azure Cloud. You can now logon to the migrated VMs to validate if the running instances on the cloud is identical to your source. In summary, MA offers an unprecedented level of automation to provide seamless migrations of heterogeneous assets, into Azure. Automated asset discovery and migration – MA portal orchestrates the discovery and migration of workloads from a single pane of glass. Migration cutovers to Azure in minutes – continuous replication and in-memory change tracking significantly reduce cutover time. Self-provisioned target Azure VM’s – Target VMs are dormant during synchronization saving compute cost and are then automatically provisioned during cutover. Heterogeneous platform support – support for broad range of environments and platforms. Continuous replication – lightweight agents on the source servers continuously replicate all changes to target ensuring near zero downtime during migrations. Multi-tier application support – migrate your multi-tier production system with application level consistency orchestrated across tiers. Target VM Network and Endpoint Adaptation – support for automated network adaptation and endpoint reconfiguration. Integrated compression, encryption and bandwidth management. To get started visit Microsoft Migration Accelerator and sign-up for preview. Today, IBM launches its new SmartCloud Entry version 3.1 that adds support for Hyper-V to VMware, PowerVM, and KVM that will be available to the public mid-June 2013. The podcast includes IBM Program Director for Cloud Computing Systems and Technology Group, Jeff Borek, Product Line Manager for Virtualization and Cloud Solutions, IBM Systems Software Team, Ian Robinson, and Alan Dickinson, IBM Program Director for Cloud Computing in Mid-sized Businesses. https://thefrugalnetworker.files.wordpress.com/2013/05/ibm_smartcloud_entry_launch.mp3 Length: 32:05 minutes, MP3 format, Rated G for all audiences. 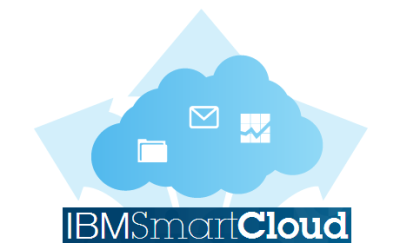 In the podcast, the IBM team and I cover the general features and aspects of SmartCloud Entry. Plus, I ask the team some tough questions about affordability, maintenance, ease of deployment of new resources and more. Why it’s frugal: IBM’s SmartCloud Entry is frugal because it enables businesses to provision cloud resources with a few simple mouse clicks, it’s inexpensive compared to other cloud solutions, it’s easy for businesses to create a private cloud without having to purchase additional hardware or without having to replace what they already have. SmartCloud Entry is multi-vendor compatible and multi-platform capable. If you don’t get all of your questions answered from the podcast, you can contact an IBM partner and connect to IBM’s Cloud Computing site for more information. The site provides you with several videos, features lists, links to products and services, and much more including a community site where you can read blogs, watch videos, and participate in cloud forums. For more information on private cloud click here to download a free ebook on private cloud from the Aberdeen Group. I’ve been compensated to contribute to this program, but the opinions expressed in this post are my own and don’t necessarily represent IBM’s positions, strategies or opinions.